Residents of Lyddington village, Rutland, are celebrating the arrival of decent broadband today, thanks to their very own telco. The residents gave up waiting for BT which declined to offer broadband in the Rutland village. So instead some 200 households raised £37,000 for the capital costs of installing fully unbundled broadband connections. Speeds have gone up from 0.5 Mbps to 25Mbps. The village claims to be the UK's first Fibre to the Cabinet project. Rutland Telecom, which installed the kit, is now hoping for enquiries from other neglected areas. 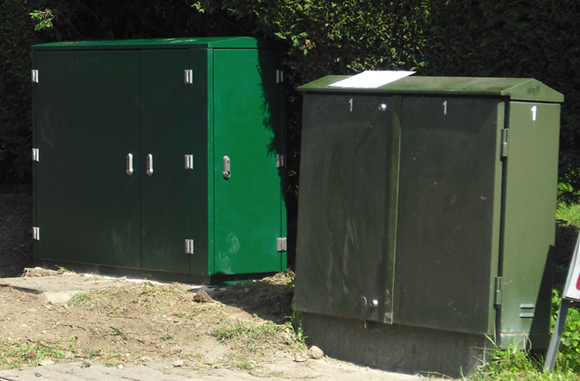 It has installed its own cabinet next to BT's - which it needs to link to for the last mile connections to villagers. It took two years, and a poke from Ofcom, to get Openreach to install the fibre, the Beeb reports..
More than half of broadband customers in the village are already on the new service and seem impressed with the speed improvement. Rutland Telecom is getting ready for the grand opening today.